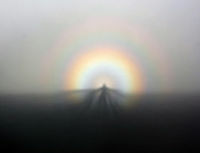 A Brocken spectre (German: Brockengespenst), also called Brocken bow or mountain spectre, is the magnified (and apparently enormous) shadow of an observer cast upon clouds opposite of the Sun's direction. The figure's head is often surrounded by the halo-like rings of coloured light forming a glory, which appears opposite of the Sun's direction when uniformly-sized water droplets in clouds refract and backscatter sunlight. A semi-artificial Brocken spectre created by standing in front of the headlight of a car, on a foggy night. Another night Brocken spectre created by high lights of a car. The "spectre" appears when the sun shines from behind the observer, who is looking down from a ridge or peak into mist or fog. The light projects their shadow through the mist, often in a triangular shape due to perspective. The apparent magnification of size of the shadow is an optical illusion that occurs when the observer judges his or her shadow on relatively nearby clouds to be at the same distance as faraway land objects seen through gaps in the clouds, or when there are no reference points by which to judge its size. The shadow also falls on water droplets of varying distances from the eye, confusing depth perception. The ghost can appear to move (sometimes suddenly) because of the movement of the cloud layer and variations in density within the cloud. Nor knows he makes the shadow he pursues! Lewis Carroll's "Phantasmagoria" includes a line about a Spectre who "...tried the Brocken business first/but caught a sort of chill/so came to England to be nursed/and here it took the form of thirst/which he complains of still." Stanisław Lem's Fiasco (1986) has a reference to the "Brocken Specter" (sic): "He was alone. He had been chasing himself. Not a common phenomenon, but known even on Earth. The Brocken Specter in the Alps, for example." The situation, of pursuing one's self, via a natural illusion is a repeated theme in Lem. A scene of significance in his book The Investigation (1975) depicts a detective who, within the confines of a snowy, dead-end ally, confronts a man who turns out to be the detective's own reflection, "The stranger... was himself. He was standing in front of a huge mirrored wall marking the end of the arcade." In The Radiant Warrior (1989), part of Leo Frankowski's Conrad Stargard series, the protagonist uses the Brocken Spectre to instill confidence in his recruits. 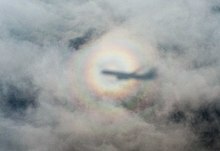 The Brocken spectre is a key trope in Paul Beatty's The White Boy Shuffle (1996), in which a character, Nicholas Scoby, declares that his dream (he specifically calls it a "Dream and a half, really") is to see his glory through a Brocken spectre (69). The progressive metal band Fates Warning makes numerous references to the Brocken Spectre in both their debut album title Night on Bröcken and in lyrics on a subsequent song called "The Sorceress" from the album Awaken the Guardian that read "Through the Brocken Spectre rose a luring Angel." The design of Kriemhild Gretchen, a Witch in the anime series Puella Magi Madoka Magica, may have been inspired by the Brocken spectre. In Charles Dickens's Little Dorrit, Book II Chapter 23, Flora Finching, in the course of one of her typically free-associative babbles to Mr Clennam, says " ... ere yet Mr F appeared a misty shadow on the horizon paying attentions like the well-known spectre of some place in Germany beginning with a B ... "
"Brocken Spectre" is the title of a track on David Tipper's 2010 album Broken Soul Jamboree. In the manga and anime Tensou Sentai Goseiger, Brocken Spectres were one of the enemies that Gosei Angels must face. In the manga One Piece, Brocken spectres make an appearance in the sky island arc. Dark Watchers, name given to a supposedly group of entities in California folklore purportedly seen observing travelers along the Santa Lucia Mountains. Fear Liath Mor, "Big Gray Man" in Scottish, a supposed supernatural being found on Scotland's second-highest peak, Ben Macdhui. ^ Jung, Carl; Jaffé, Aniela (1989). Memories, Dreams, Reflections. Vintage. p. 88. ^ Shipton, Eric (1969). That Untravelled World. Hodder and Stoughton. pp. 55–56. Shenstone, A.G. "The Brocken Spectre". Science. 119 (3094): 511–512. Bibcode:1954Sci...119..511S. doi:10.1126/science.119.3094.511. Goodrich, Samuel Griswold (1851). Peter Parley's Wonders of the Sea and Sky. Minnaert, M. (1954). The Nature of Light and Colour in the Open Air (Paperback). Dover Books on Earth Sciences. Greenler, R (1980). Rainbows, Halos, and Glories. Cambridge University Press. Dunlop, Storm (2002). The Weather Identification Handbook. Harper Collins UK. p. 141. ISBN 1-58574-857-9. Wikimedia Commons has media related to Brocken spectres.